Showing results for tags 'soda machine'. Good morning everyone! My name is Kevin, I live in Westchester County, NY (if any other vendors are close by). I’m diving headfirst into the vending business, with 2 used soda machine and 1 used snack machine. I have tons of questions about my machines, however I am merely testing the waters on this forum to see how responsive this community is. Have a great day everyone! I hope to hear from you soon! My highschool ag department has recently bought an old 1970's/1980's Pepsi six selection vending machine and we need to find out who made it, and we need to find a service manual or something to rewire and refurbish it. I took several pictures to help people try to find it. Please reply to this thread to help us in any way! Cannot get around a compressor fan issue and could really use some guidance. Here's a quick course of events: Compressor fan stopped working, though compressor continued to run >> Replaced entire fan/motor assembly >> Fan still does not turn on >> Replaced overload >> Fan still does not turn on >> Check voltage from power cord that runs from main wiring harness to the compressor relay/overload >> Fan still does not turn on When main power is plugged in everything powers on EXCEPT the compressor fan, including the compressor. What am I missing here? Could it be the thermostat? Or the relay? If it's the relay, then why is the compressor powering on? Thanks in advance. Help! Snack, Soda, or Combination Machine? Hello and help. I have a vendo 480 that is giving me a column jamb error code. It says that all the columns are jambed and when I press the door switch the motors start vending out drinks for 2 turns and then time-out and stop, one after another until all the motors have rotated a couple of times and then randomly stop. I have replaced the fuse, coin mech, and the board off of a working machine. I also checked for loose connections, pinched wires, and spilled soda and electrical or motors. When I close the door the read-out reads 8.8.8.8. for the longest time, then shows "sold out". I would appreciate any help on this, thank you. What is the check list to buy a used cold drink machine? Hey Guys, I have been looking around but could not find a right on topic that I'm looking for. I am brand new to business, looking to buy some used soda machine only, or combo soda and snack. What is a check list or tips to buy a used machine? For me I always go for a first look, just like picking the ladies but I could be wrong. Should I concern about motor? coin, bill operation? credit card? Bill changer? What is bill changer actually? Any tips? you tube? suggestion would be much appreciate. Lastly I attached one that I'm looking, maybe you guys can give me a suggestion. 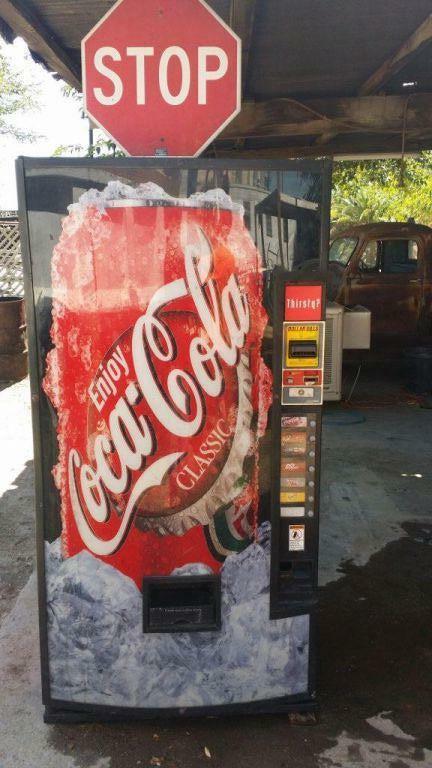 Refurbished Dixie Narco BevMax 5591 Soda Drink Vending Machines/ $2100 Cheers!